The newly voiced (by Robery Downey Jr.) Mr. Peanut, silent for the first 94 years of his life, is host to a holiday party at his house. Everyone's in attendance including an unexpected guest, the Nutcracker, who, sadly, misbehaves but gets a just punishment from Mr. Peanut. 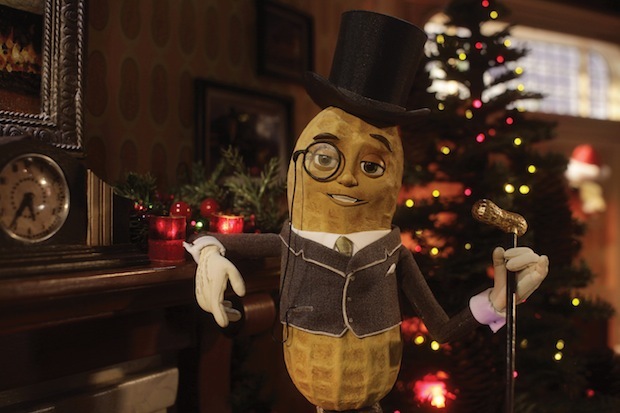 The ad, which debuted yesterday, is part of a $35 million "character revitalization" campaign which is giving Mr. Peanut somewhat of a makeover looking more like a nut and being dressed in a flannel suit. The trademark top hat, cane and eyepiece will remain. Omnicon TBWA New York spin off Being created the campaign which includes POP, online and print. The campaign's new tagline is "Naturally Remarkable."